Effectively Striking the Heart of the Foe. The Wheel of Sharp Weapons Effectively Striking the Heart of the Foe was composed by the great Yogi Dharmarakṣita in his retreat in the jungle where many fierce animals prey. He always practiced in accordance with this essence in his fearsome jungle retreat during the degenerate age in which he lived. From among his many disciples, Dharmarakṣita transmitted these teachings to Atiśa; and Atiśa practiced them wherever he travelled in order to tame those who were most wild. I met my true guru, Dharmarakṣita. having memorized fully these words he has taught. have been of great help in this age of decay. 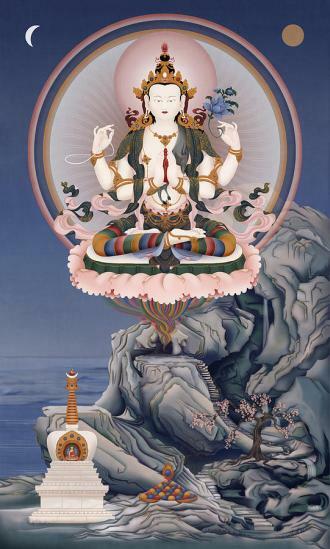 From among his many unimaginably great disciples in both India and Tibet, Atiśa transmitted these teachings to Upāsaka Dromtönpa, who had been prophesied to be his most fitting disciple by many of Atiśa’s meditational deities such as Tārā. Atiśa transmitted these teachings to Dromtönpa in order to pacify the minds of the disciples of remote Tibet who were difficult to tame. This work has been translated from Sanskrit into Tibetan by the fatherly Atiśa himself and his spiritual son Dromtönpa. I pay heartfelt homage to you, Yamāntaka; your wrath is opposed to the Great Lord of Death. though medicine gardens of beauty lie near. but thrive on the essence of poisonous plants. remain in the jungle of worldly concern. but thrive in the jungle of suffering and pain. thus since we are cowards, we are miserable still. and gain from their courage a true lasting joy. Now, desire is the jungle of poisonous plants here. Only brave ones, like peacocks, can thrive on such fare. because they are greedy, they might lose their lives. take lust and such dangerous poisons for food? he would probably forfeit his chance for release. they live on delusions – those poisonous plants. they thrive in the jungle of everyday life. while destroying the poison of clinging desire. is caused by our grasping at egos as real. we want only pleasure and shun any pain. and gladly take hardship for all others’ sake. of selfish delusions we heed and act out. and smother our wishes of selfish concern. we must blame our self-interest and feel it’s our due. returning full circle upon us from wrongs we have done. hereafter let’s take on what sickness is theirs. hereafter let’s take on this suffering ourselves. we have plundered and stolen and lured people on. hereafter let’s take from them hunger and thirst. with humble devotion of body and life. we have slandered and caused many friendships to end. hereafter let’s censure all thoughtless remarks. we have criticized others, seeing only their flaws. and view our surroundings as stainless and pure. hereafter let’s never cause close friends to part. with those who would turn us away from the path. but give them full credit for virtues they have. that rouse them to follow their negative traits. but out of their presence have reverted to sin. and take all the teachings sincerely to heart. hereafter let’s stop our offensive behaviour. hereafter let’s change and show only kind ways. nor pretend to be kind while we harbour base aims. offered to the Three Jewels of Refuge as if it were ours. hereafter, let’s shun such non-virtuous deeds. to listen and think about what Buddha taught. hindering our practice of virtuous acts. we have sat on our books and left texts on the ground. let’s gladly endure all the hardships we meet. (and see the impermanent nature of things). hereafter let’s practice with patience and strength. and leave our non-virtuous actions behind. his teachings and those in his fold. hereafter let’s banish all prejudiced views. by evicting them cruelly from where they reside. hereafter let’s keep all our moral vows pure. Till now we’ve been misers, reluctant to share. hereafter let’s give with a generous heart. and not be short-tempered, but be of good cheer. hereafter let’s uproot self-interest completely. so that others may thrive.